Learn all about Swing Dancing! Swing dancing remains one of the most popular dance styles in modern dance clubs. Three dances, in particular, make up the basis of swing dancing: the Lindy Hop, the Charleston and the Jitterbug, but the beauty of swing dance is that improvisation is encouraged. The basic dance steps of each style are relatively easy to learn, and as you gain more confidence you can layer on different moves as the mood — and the song rhythm — strikes you. The Lindy Hop, Charleston, and Jitterbug are some of the earliest and most popular swing dances, but in the ninety-plus years since its invention, swing dancing has evolved as swing music itself continues to absorb influences from other musical styles, from R&B to country and western. Regional variations have also contributed numerous unique moves, from the Imperial Swing in St. Louis to the Houston Push. 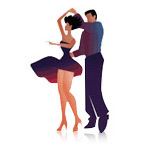 Many people think of swing dancing as the fast, almost gymnastic-type choreography often seen in films and reality show competitions, but over the years most dance studios — including the Arthur Murray Dance Studios — have successfully developed styles of ballroom swing dancing appropriate for the general public. And of course, the original dance moves — the Lindy Hop, Charleston and Jitterbug — remain some of the most popular with dancers of all ages and abilities. Although many musicians have composed slower, more “user-friendly” swing music, in general, swing music tends to be relatively fast and energetic. Fortunately, the basic moves can be learned quickly and lend themselves beautifully to improvisation. Begin with some of the slower swing dance songs and work your way up to those with faster rhythms as you become more confident. Try not to look down at your feet as you dance. Focus on the music and your partner. Remember what your mom told you when you were learning to ride a bike? Staring at the ground only guarantees a face plant. The same applies to swing dancing: keep your eyes up, or you’re almost certain to make a misstep. Partners begin facing each other in closed position. Keep your shoulders relaxed and your head up. Keep your steps small and compact. Start in the closed position, i.e., your feet close together. Step back with your left foot, putting all your weight on it in a rocking motion. Step to the left with your left foot. The follower mirrors the above basic dance step, starting off with her right foot rocking backwards as the leader rocks backwards with his left foot. As you progress with the Lindy Hop, you can add more elaborate moves, including turns and spins. Remember to have fun and improvise!